Day of Eating 40 carbs! Where have I been? I am going to get back into the swing of things on here in a week or two when this project completes. I hit 163 while I was traveling in Pittsburgh and was really happy about that but last week I was at the same number so still some work to do. I have 3lbs or 3 weeks left on the cut and I think that it is starting to affect me mentally as I really just have been feeling lazy lately and have had little motivation at work. I am going to rant a bit about life here so you can skip to the next paragraph is you would like. I loved my job and group but as I am reaching the end of the cut I am starting to dislike it more and more. Hoping that this mind set changes when I start turning the diet around or if its real I am glad I realized it and what this transformation has shown me is that I can do what ever I set my mind to and I will be able to find something that I enjoy. I still love where I work but would like to find something different. My macros this week have changed a bit to a little lower protein but a little extra carbs on lifting day which is a huge help because I have just not had any energy to get my cardio in but was really forcing it. Hoping that it might also help with some recovery because it is taking from one leg day to the next to have my legs recover. So for the eating today. I will get pictures up throughout the day. I got a new camera so they will be more “artistic” but need to be pulled off the camera instead of having them go straight to OneDrive. I am also recording today with the camera so well see how it goes. Todays macros are 40c/45f/200p and its going to be a rough day ahead to stay full! All carbs are coming from veggies and the cheeses that I will use on my frittata’s and salads. Breakfast today was a pretty simple 4 ingredient frittata and a cup of coffee. Normally I don’t have coffee but I have been turned onto K-Cup donut house cinnamon roll and chocolate glazed donut and they are great! I put the zucchini and spinach in a hot pan to wilt the spinach and soften up the zucchini for about 3 minutes. I added some Mrs. Dash Extra Spicy, Onion and Herb, and onion powder to flavor the veggies. Once they were the right texture I added the egg whites and mixed in the kefir cheese. I placed it under the broiler for 7 minutes to get it cooked off and while that was going on I made the cup of coffee. Once the 7 minutes was up I dropped it on the plate and put a little salt and mustard on top and that’s it. A nice quick and easy breakfast. Hoping that this will hold me over for a while! The next two meals will be salads because I will be eating them at work. One thing about veggies is that you can get great volume and I will be eating an entire bag of Trader Joe’s butter lettuce with both some chicken in one and turkey breast in the other. Both get a serving of the kefir cheese and I will be using a bit of Walden’s Farm Sweet Onion dressing for some additional flavor. Just trying to get through the day without cheating! I think the key will be making some Xtend slush. These are easy and they feel like your eating but its all water and BCAA! If I could just find a way not to get cold for a couple hours after I eat one! Stay tuned for the rest of the day! I’m back and at work now. I like having the luxury of being able to work from home but sometimes just being that makes me just want to eat. So at 10am I decided to have my mid morning meal. I was pretty happy with how long I was able to hold out to space the meals out. Nothing seems to be going right with work and the way the day has been going so I think the stress is helping to keep me thinking of something other than eating. As I said before I was having a salad. I also had another cup of coffee on the drive in to help me through the day since I am running on such low carbs. As I said this was a pretty simple but refreshing salad. I added a bunch of cilantro and dill to liven it up. What I did was combined the lettuce and chicken in a bowl and then in a small bowl I made a dressing out of the Tabasco, kefir and some of the dill. This was actually a really nice refreshing dressing. I added a bunch of cilantro to the salad and some more dill and tossed it with the dressing. Luckily this was pretty filling and my goal is to not eat again till 1-1:30pm but again being at work I need to just stay focused and not really think about food and try to keep active. Stay tuned for more soon! Sorry I forgot to complete this entry! Its now almost a week late but going to finish what I ate! Dinner was a big frittata! I made my own Guacamole by taking some avocado and kefir cheese and combining them with some garlic salt and onion powder which came out awesome! In the frittata I mixed 42g of spinach, 3oz of Trader Joe’s cooked sirloin, 1 pack of Miracle Rice which has 1 carb, and some laughing cow Queso. Followed my normal frittata procedure and then covered it with the guac! Finished the day off with some mint chocolate chip Frotein. Followed my normal procedure of three ingredients. Put 2 cups of Almond milk, 1/2tbsp Xanthum gum, and 47g of Cellucor Mint Chip protein powder in my kitchenaid and whip till it fluffs up a bit. Add blended ice and continue to mix till it reaches the desired consistency! The frotein actually fell off the couch making it a really miserable end to a pretty stressful day! In all I hated the macros for today and just hope I can get through a couple more weeks. I finally posted my first day of eating video. I will probably record another one tomorrow. This is a day in the life of my legs day last Saturday. I have just finally finished editing a new video for you all. Here is my recipe for stuffed poblano peppers. This has become one of my favorite meals and its actually something that I have never had in a restaurant. I will also be putting together a day of eating video that I have been recording today with an amazing frittata recipe. Thanks as always and I look forward to hearing from all of you! I finished up my first Sweet Eats series video for my cannolis! Check it out and let me know what you think. Don’t for get to like and subscribe! Hey guys and gals. It Saturday and I am getting caught up on some videos. This one didn’t really need a voice over so I was able to work on it while I was watching the Penguins game. I posted earlier about my trip to Sur La Table and World Market and here is the video of everything that I picked up. Check it out and let me know what you think, other than the audio is kind of crappy. Hey guys and gals! Here is another day of eating post. I also post the video for my Pittsburgh Sandwich. My carbs are a little higher today because it is a leg day and my coach has me increasing my carbs on leg days instead of reefed days. I actually like this better. Todays goals are 220c/55f/230p. This morning was a little rough after my two hockey games being a little late and the league was running behind so I didn’t get home till after 11pm and was up at my normal 5:30am. I started breakfast by cooking up 70g of mushrooms then tossing in some spinach. Once the spinach was a little wilted and the mushrooms were soft I added 224g of egg whites international egg whites. As the omelet was cooking I started to assemble my puffed kamut. I put 3 serving which is 45g in a huge bowl and topped it with some Walden’s Farm Caramel syrup, couple of grinds of sea salt and some Walden’s Farm pancake syrup. I added 3 cups of Unsweetened Vanilla Almond Milk then topped the whole thing with 20g of chocolate whipped topping. Very filling and GAF! 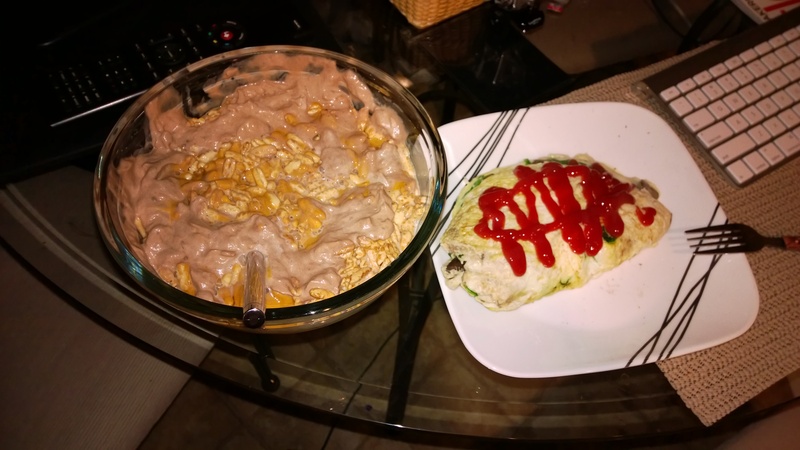 Spinach and mushroom omelet and salted caramel puffed kaumt. On my way to the gym I took a One a Day MV, 2 fish oil soft gels, 5g of creatine and one scoop of Cellucor C4. Hammered out a leg workout that was tough with my legs still being pretty tired out from hockey the night before and running on shorter than normal sleep. After the workout I had 40g of prunes, 1 scoop of MTS vanilla and one scoop of Cellucor Cinnamon Swirl. Once I got to work I had my second meal. I had a salad with 85g of butter lettuce, 100g of spaghetti squash, 200g of coleslaw, 28g of fat free cheese, and 124g of Gifiltte Fish. I prefer the taste of the Gefiltte fish over that of the Whitefish and Pike. This salad had no dressing and I enjoyed getting the flavors of everything without it being masked by the dressing. I did get a box from vitacost.com yesterday and picked up some Walden’s Farm Sweet Onion dressing that I tasted and it was definitely a keeper. I’ll go over everything that I got from them in a video soon. Top view of the salad. For lunch I had a salad with pork, sauerkraut, coleslaw, butter lettuce, broccoli and Miracle Noodle rice. I used some Braggs as the dressing. Things were crazy at work so I didn’t get a picture of this but is came out great and I liked the “rice” I will definitely be getting more of it. Dinner was kind of a homemade pizza pocket. I took two slices of oat Mountain Bread and on one put 63g of Pizza sauce, 28g of fat free mozzarella, 50g of pork and 50g of mushrooms then placed the other slice of Mountain Bread on top and toasted it. Used a little scorpion chili as I was eating it. This was a winner. Pizza after the first bite. I have been craving caramel popcorn the past couple days since I picked up a candle the smells like it. I haven’t been able to stand pop corn since living with my ex and should would burn it constantly. I found some pretty macro friendly caramel microwave popcorn from Orville Redenbacker. 1 cup was 9c/3f/0p. To go with my popcorn I made my Pronnolis. I used chocolate protein this time to make the filling and it came out awesome. I didn’t get a picture of them but below is the rest of the fluff and the popcorn. In all it was a winning meat day. 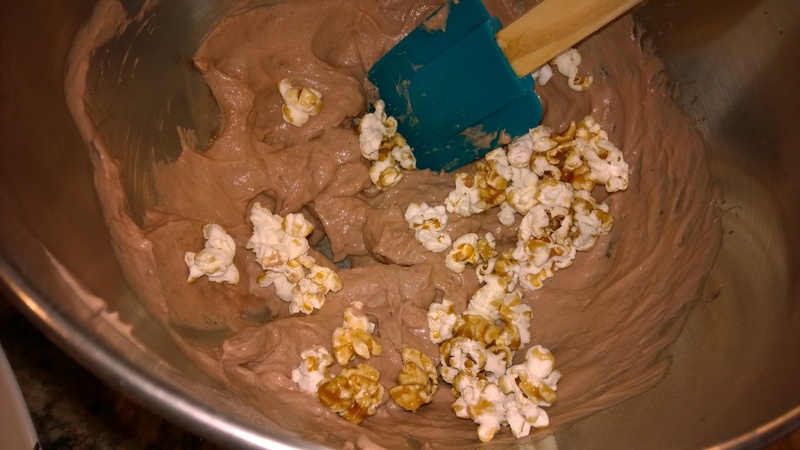 Caramel popcorn in chocolate fluff. Finally starting to make some progress on the videos! I got the Tuna Casserole video posted today. It turns out the microphone I got does’t work with my new iMac so I am going to have to go pick up a new one tomorrow to do some of the voice over work for the rest of the ones I have prepared. Let me know what you think and how you like the recipe! New Computer Mean New Videos! Well guys I got my new iMac 27″ setup and put together a couple of videos. Its weird using a Mac for the first time since elementary school and considering I actually work for Microsoft I have to say I like the hardware but the OS is going to take sometime. While the videos I posted are getting better I am still deciding on editing software to make them better between Adobe and Final cut. Lets get the videos going! First I posted up my pork and sauerkraut cooking video. This is a quick and easy way to have a large amount of meals ready to go for the week using a slow cooker. Next I put together my Shopping2Fit series first episode. I recorded what I picked up at Whole Foods the other day and got some pretty good stuff for pizza and other foods. Let me know what you think of the videos and don’t forget to subscribe to the channel. I’ll have a few more food photos up today. With the new Adobe stuff that I am thinking about getting I will be able to do some touch ups.